Handy Backup allows making enterprise endpoint backup, the centralized collecting of end-user data from any devices and storages outside the local corporate network and securely storing these data to a selected vault. To be secure and effective, any good endpoint backup solution must meet some requirements listed below, for both end-users and the company IT department. Scalability. The software solution must allow endpoint backup from any quantity of end-user devices, with fast and reliable methods of deployment and scaling the solution. The unlimited quantity of single-machine Handy Backup copies can share a common backup storage at the same time. Network editions also provide a centralized deployment. Security. To provide endpoint data protection outside the common enterprise firewall, the enterprise endpoint backup software must have internal methods of data protection. Handy Backup allows endpoint encryption with a 128-bit BlowFish algorithm, securing these data for transferring. It also provides secured SFTP and FTPS access. Storage. The program must provide endpoint cloud backup for a particular cloud service used by a company, including private and dedicated clouds. In Handy Backup, any cloud with a generic cloud interface (WebDAV) can serve as a data storage. In addition, it provides dedicated cloud features, such as Amazon S3. Simplicity. An endpoint backup solution works with end users at first hand. Therefore, it must produce minimal distractions and troubles in their daily job. Handy Backup has a couple of instruments allowing minimizing end-user distractions, including scheduling backups, running in silent mode and centralized backup tasks. Handy Backup meets all criteria of endpoint backup definition. It is capable to take data from any devices and storage units (including Google Drive, Amazon S3, Windows OneDrive, Box, NAS and FTP units etc.) and save it to any vault approved for centralized corporate backup. Commercial clouds, e.g. 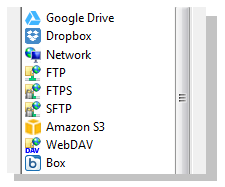 Google Drive, Amazon S3, Box, OneDrive, 4shared and other. Besides the storage types described as endpoints (yes, all these storages can serve as vaults, too! 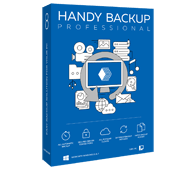 ), Handy Backup provides an extra option for saving your data backups in safety. This is HBDrive, a dedicated cloud service placed physically in a secure hi-tech data center in USA. From computers of employees engaged in some project – to a trusted HBdrive account. You can quickly modify any of these existing endpoint backup schemes to change the endpoint device set, the destination or both parameters; it can be effective to use two or more schemes simultaneously, or to invent and add a new scheme. The Professional edition provides an excellent endpoint data protection for an unlimited quantity of end-user devices. Free 30-days trial version! The task of accessing and restoring enterprise endpoint backup is as important as the task of taking snapshots of these data. Any end user must have an option to find and restore (or just view) the data needed as quickly as possible, perhaps, without total restoration of a dataset. If a backup task forces no endpoint encryption or ZIP compression for data transferred to a backup cloud, all information copied by Handy Backup retains its original data formats. Therefore, any user can open the backup folder and directly view or copy any file or folder needed from a backup. Note: To do it, a user must have permissions for accessing a backup data storage and/or a particular folder inside it. Therefore, an IT department and data administrators always have a final decision about allowing end users viewing and modifying their backups! A good endpoint backup software is just a part of a general security strategy for an enterprise. The best endpoint backup software is a program allowing integrating it into a complex, scheduled and pre-planned chain of different data-protecting actions. Running it as a command-line application, allowing batching its run. 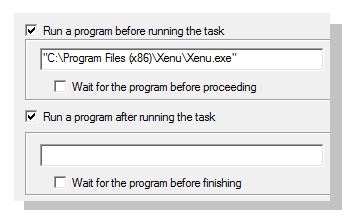 Starting other applications or batch files (command lines) before or after each task. Notifying selected users about its activity through email messages. 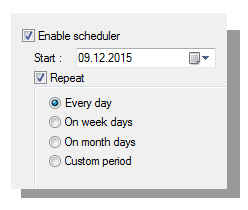 Creating versioned backups and marking backup data with time stamps. Compared to many other endpoint backup vendors, Handy Backup provides more functionality-to-price ratio. It uses a simple payment model without extra fees or annual charges, and its licensing is permanent for a major version, including free updates. Handy Backup provides endpoint protection backup for devices running under any modern version of Windows, including Windows 10, 8.1/8, 7 and Vista, as well as Windows Server 2012(r2) and 2008(r2). It supports domain, non-domain and mixed network architectures.